Later today, Sint Truiden face Eupen in a top of the table clash in Belgium’s second division. The home team’s coach is 34 year-old Yannick Ferrera and with his team eight points clear of today’s Qatari-backed opponents, Belgofoot recently caught up with a young coach who has packed a lot into his career to-date. Ferrera took over at Sint Truiden at the start of the 2013-14 season with the task of gaining promotion to Belgium’s Jupiler Pro League. He managed to get the club into third place and although this meant the club entered the Playoffs, Sint Truiden missed out on the first division. But now Sint Truiden are on a roll, winning 14 and drawing three of their last 17 games. Our first question was therefore, what’s made the difference this season. Ferrera points to the team and his staff having gained maturity and an understanding about what it takes to succeed in the second division. Pointedly, Ferrera says that players who were not right for the squad have left and been replaced in the main by youngsters. Asked to identify some of his young charges, Ferrera mentions French midfielder Pierre-Baptiste Beherlé (23), CAR international forward Hilaire Momi (24) and Polish striker Piotr Parzyszek (21), on loan from Charlton Athletic. Ferrera regards Parzyszek – leading scorer with nine goals – as a real ‘fox in the box’. Having worked with several talented youngsters in his career, Ferrera also singles out 19 year-old Gaeten Hendrickx who has started over 20 games in his first professional season. The current squad has an average age of 22 and Ferrera stresses that he’s had the chance to bring in the players that the coaching staff wanted. He feels that’s rare in Belgian football. Asked about the clubs style of play, Ferrera says they play collectively, “in the style of Athletico Madrid”. He adds though that he may need to review the squad if the club is promoted to the Jupiler Pro League. One source of new players for Sint Truiden has been top-division Standard Liege. Sint Truiden were owned by Roland Duchâtelet until he took over at Standard in 2011. The Belgian businessman continues to live in the city and his financial input was responsible for the club having one of the most modern grounds in the country. Both the ground and its facilities, including a hotel and shopping centre, are owned by Duchâtelet’s partner Marieke Höfte. Although there is no official connection with the Duchâtelet network, Ferrera acknowledges that players have often moved between Sint Truiden and Standard Liege. He notes though that the most recent loanees from Liege have not been able to break into the Canary’s first team. Ferrera is a member of a footballing family with his two uncles, Manu and Emilio, both having extensive caching experience in Belgium and elsewhere. In his early 20s, Ferrera coached the Anderlecht youth team and his charges included Romelu Lukaku, Adnan Januzaj and Charly Musonda Jr. He selects the last-named as the most talented player he’s ever coached and – sending a message to José Mourhino – Ferrera says he’d love to have Musonda on loan at Sint Truiden next season. 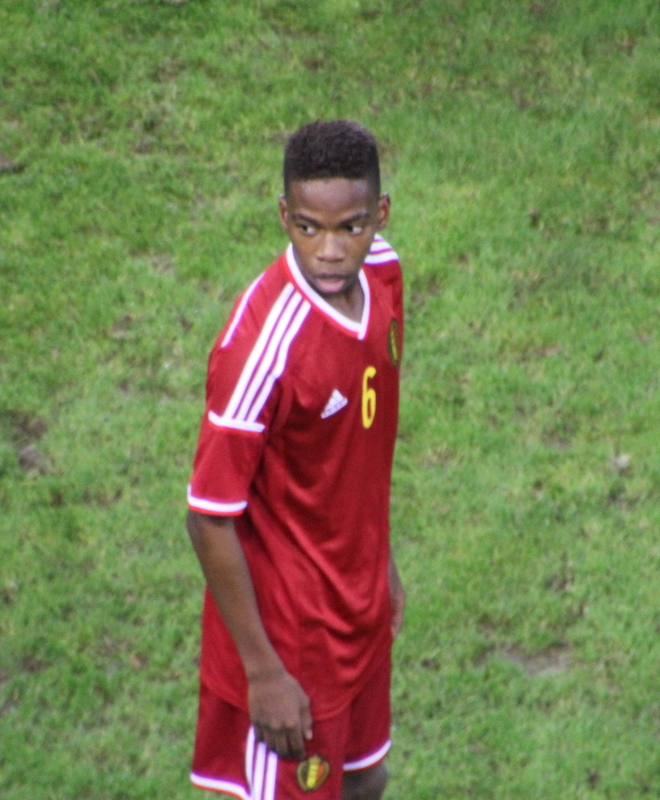 Charly Musonda Jr with the Belgium U21s. “Most talented player” coached by Ferrera. After his time at Anderlecht, Ferrera moved to Gent, under Francky Dury and Michel Preud’homme, and at Al Shabab Riyadh in Saudi Arabia, again under Preud’homme. Ferrera has learnt from both coaches and asked to explain the differences in approach between the two; Ferrera stresses Preud’homme’s technical ability and his work ethic. With Preud’homme at the helm, everyone was certain to be going in the same direction. As for Dury, who has worked wonders with Zulte Waregem, Ferrera says he’s calmer than Preud’homme and is someone who would never panic. Above all, Ferrera adds, Dury is a ‘people person’. 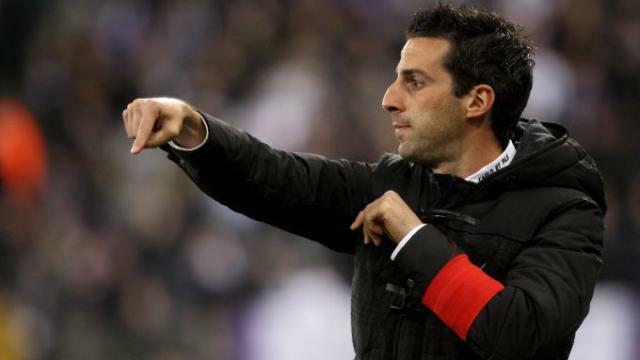 After his experience in Saudi Arabia, Ferrera returned from Belgium where at Charleroi, aged 31, he became the youngest ever coach in the Jupiler Pro League. Hired by the infamous Abbas Bayat – Ferrera was the 20th coach hired by Bayat in 12 years – Ferrera saved the club from relegation but later resigned as he had personal issues with the new Charleroi ‘strong man’ Bayat’s nephew Mehdi. Although many people were surprised by Ferrera’s decision to resign, he feels that people in the game understood and respected his reasons. Ferrera believes that you need to build a reputation – by winning trophies – and that having such standing is more important than money. Aiding him in the quest to win such trophies is a young staff, including Chris O’Loughlin from Belfast as assistant coach. Ferrera met O’Loughlin, who has had experience coaching in South Africa, the Congo and in Australia, through the social media site LinkedIn. Also on board is 22 year-old Englishman William Still, who wrote into the club and has the job of analysing opponents. With the Duchâtelet links, and with Charlton Athletic being part of the well-known ‘network’ of clubs, it seems natural to ask Ferrera about Charlton Athletic as a possibility at some time in the future. Ferrera acknowledges that the English ‘Championship’ could be a way of one day reaching the Premier League, his long-term ambition. But for now Ferrera’s priority is to have a club that will back his judgement and that certainly seems to be the case at Sint Truiden.